The Virtual Boy is a supposedly fifth-generation handheld game console released by Nintendo and created by Game Boy creator Gunpei Yokoi on August 14, 1995. It has a NEC V810 CPU. 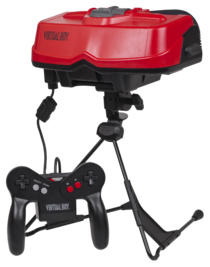 It was the first games console to utilize 3D effects, however, is notable for only displaying graphics in red and black, as well as requiring users to attach the console to their head, usually while rested on the included tripod. The product was pulled shortly after release due to the majority of users getting headaches from using it. Notably, it was rushed to market and was never meant to be released in its current form. Has 100% compatibility with commercial games. Lets you change the Virtual Boy's color output to any hex color. For example, changing it to white shows all the games in greyscale instead of red, which really helps. 3D is enabled by default, but you can turn it off. To play it on platforms not supported by Mednafen use the libretro port which also supports SBS 3D by using glsl shaders, check this Reddit post for instructions. Also has 100% compatibility with commercial games. Has a fork that supports the Oculus Rift. Claims 100% compatibility, however, accuracy isn't as good as Mednafen or even VBjin, and speed is even worse. Supports 3D on the New 3DS. Is slow and not finished. Based on Reality Boy / Red Dragon. Is an up and coming emulator for 3DS (New and Old) and other systems. Full 3D support on 3DS is promised. This page was last edited on 14 April 2019, at 08:14.